Shana is a young girl with jet black hair which is almost as long as her entire body height. She also has dark brown pupils and a fair complexion. Because of the effects of being a Flame Haze, Shana's body age remains to that of a girl of 13 to 14 years old. Upon invoking her powers as a Flame Haze, her hair and eyes change color to a fiery crimson, with embers fluttering from her head down. In her first few years as a Flame Haze, she wears an all-black attire consisting of a shirt, pants and her Treasure Tool Yogasa in the form of a trench coat. However, after she decided to stay in Misaki City, she is most usually seen with the Misaki City Municipal High School uniform and when in combat, has the Yogasa as a cape worn over her clothes. She is later seen wearing a red-and-black frilly dress on her stay inside the Seireiden. Initially, she is concentrated solely on her duty as a Flame Haze, not even considering getting a name as she didn't see any importance having it. She sees Yuji only as a Torch, an object, albeit marginally interesting because of his status as a Mystes. However, she slowly opens up to Yuji, coming to think of him as a person despite being a Torch, and eventually comes to show affection to him. Her duty made her indifferent towards human life at first, but through Yuji's influence, Shana has opened up slightly, although she still remains confused and disgruntled by some human traits which she considers as pointless, although some of it is used to mask her jealousy of her desired monopoly on Yuji. Shana has a habit of saying "Urusai! Urusai! Urusai!" ("Shut up! Shut up! Shut up!") whenever Yuji asks her questions or makes remarks that disturb her original worldview or embarrass her. But in reality they really care for each other. She has a great fondness for anything sweet, eventually putting melon bread above her preference. Shana is shown to be highly intelligent as she has gotten a perfect score on every exam and is talented in Physical Education. She is shown, however, to be naive when it comes to social affairs, once even unabashfully asking "how babies are made" to Chigusa. Known only as the "Flaming-Haired, Blazing-Eyed Hunter," Shana bears no name until she meets Yuji, who names her after the sword she wields. As a "Flame Haze," Shana is sworn to protect the balance of the world by hunting down the "Guze no Tomogara;" monsters from the "Crimson Realm" who come to earth in order to harvest the "Power of Existence" from its denizens. Together with Alastor, "Flame of the Heavens" and Shana's guide who lives within her, and speaks to her through a necklace she wears, she has become one of the most powerful Flame Haze in existence. 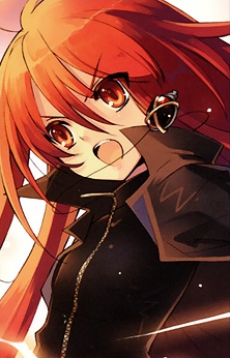 Shana is said to be the most powerful, known and feared by most Crimson Denizens with her title alone. This has allowed her to defeat many powerful Denizens, and permits her many different abilities, including her proficiency with the Nietono no Shana, the ability to wield flames, manipulate the Power of Existence, harbor extrasensory traits, and fly with wings of flame. In the third volume of the manga, the first volume of the novel, and the movie, Alastor states that the reason why she did not explode after being shot by Friagne's Trigger Happy was because she held a capacity that existed in dimensional space, who was able to contain the Flame of Heaven's (and more); He has thus stated her as "The Great One". Unrestricted Spells Wings of Crimson (紅蓮の双翼 Guren no Souyoku?) - a pair of fiery wings appear on her back, allowing flight. At first, Shana is not able to use this spell without Yuji in range;later on, she manages to use Guren no Souyoku when she fought in later battles. These wings were fast enough to evade Hecate's powerful Aster spell. Great Blade of Crimson (紅蓮の大太刀 Guren no Oodachi?) - coats Shana's sword with a flame which she can use to hurl at enemies from a distance. Heaven-and-Earth Sundering (天破壌砕 Tenpa Jousai?) - an Unrestricted Spell inherited by Flame Haze of the title "Flame-Haired Burning-Eyed Hunter". Using up an enormous amount of Power of Existence, Alastor materializes in the living world, causing widespread damage in a large area. Flame Haze who use this spell usually loses all of their Power of Existence as requirement of the spell and dies; Shana manages to survive using this spell because of the amount of Power of Existence she can carry, unlike her predecessor Mathilde Saint-Omer. In the novel, she doesn't use this spell yet since the anime's finale was originally written. However, she demonstrates a clear lack of experience in battle, as noted by Sophie Sawallisch, who has witnessed her fighting style first-hand.This is once responsible for her defeat against Flame Haze Margery Daw, who is a specialist in Power of Unrestraint. She was rescued and picked up by Wilhelmina Carmel and Shiro when she was an infant. She was then raised and trained in Tendoukyuu. Alastor stated that she is "The Great One", destined to be a very majestic figure when she grows up (if she didn't get involved with Crimson Realm beforehand). After the destruction of the Tendoukyuu, she and Wilhelmina went their separate ways in Hong Kong, with the latter's intentions of allowing her to learn on her own as a Flame Haze. The new "Flame-Haired Burning-Eyed Hunter" proceeds to her solitary journey, eventually becoming a companion of Sophie Sawallisch, a veteran Flame Haze, in Eastern Europe. Sophie notices her crudeness in combat and lack of femininity and decides to train her, while teaching her the ways of being a lady. The Flame Haze later travels to Japan, where she is involved with affairs relating to a certain Denizen which dwells in Yosegi City before reaching Misaki City. She later meets Yuji by chance in one attack initiated by Friagne, the Crimson Lord who was staying at that city. Despite being the title character of the anime, Shana has few character relations with many of the characters in the show. That would be because of the manner she was raised. Wilhelmina, Shiro and Alastor mostly focused on her physical and mental being, forgetting that being as socially adept is as important. This was, as Alastor said, one of their mistakes, since they thought that they would just teach her these feelings when she grows up a little more, not realizing that these feelings should be developed, and could not be taught so hastily. (Although, Shiro did teach her indirectly that love is the most powerful unrestricted spell of all.) Her main social interest is Yuji, whom she sees as her love interest. Her relationship with Yuji is one of the driving forces of the series. Shana takes orders and advice from the Crimson Lord she is bound to, Alastor, and has a mentor and guardian in the form of Wilhelmina Carmel. Kazumi Yoshida is her love-rival for Yuji, and Shana treats her with contempt and disdain. She generally treats most other characters with ignorance and indifference, with the exception of Chigusa Sakai, who she looks to as a source in answering certain difficulties when Alastor or Wilhelmina are unable to do so. Shana eventually starts to be more open to the other characters, especially in regards to her relationship with Kazumi becoming more friendly. After meeting Yuji, Shana goes through a chaotic phase in she experiences new emotions like love, jealousy, hatred, and loneliness. This leads her to making rash decisions in battle as she's unable to identify or deal with what she's feeling. When Shana finally realizes that having Yuji with her in battle helps her fight better, she begins to unlock new abilities and becomes more proficient in battle. The sudden disappearance of Yuji and all traces of his existence left Shana heartbroken, although she manages to gather herself and investigate the extent of Yuji's disappearance. Using Yuji's last memento, the letter that he returned to her and Kazumi, she undergoes training with Margery to hone her spellcasting abilities. Upon Yuji's return to Misaki City as Bal Masqué's newest leader,Shana is defeated and taken by Yuuji to the Seireiden, where she is confined to a single room and tended to by a couple of maid Rinne. She can't use her powers because of a minature version of Bel Peol's Tartaros. The Nietono no Shana had also been taken. Shana was about to be killed by Hecate, but was saved by Yuji. She is later seen wearing a frilly dress. Due to the chaos caused by Khamsin and Rebecca infiltrating Seireiden, Shana is able to escape the maid Rinne. She calls out for the Nietono no Shana, awakening Tenmoku Ikko, who returns it to her. Shana regains her powers and meets the Crimson Denizen Uvall. She is able to kill him by using her new Unrestricted Spells, Hien, Shinku, Shinban and Danzai. She escapes and meets Khamsin, Rebecca, and Wilhelmina outside. With her freedom secured, she decided to fight against Yuuji and love him until the end. Through the various difficulties faced throughout the course of the battle, Xanadu is created and the war between Bal Masque and Flame Haze ending, Shana and Margery Daw came to meet Yuuji and Sydonay. In the anime, Shana defeats Yuuji and makes him take her together to Xanadu, which is different from the light novel.